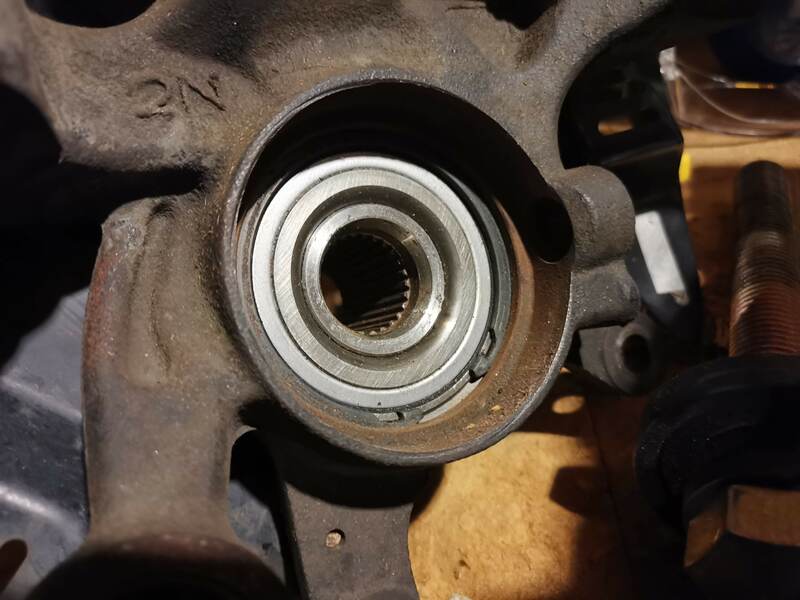 Yes, that's very similar and would probably work but maybe not with your electric impact, you could try it though if you don't want to take it to a shop, and you'd have a cup to press the bearing out into in the future as well. Yeah I think HF one would strip out if hit too hard. I'm definitely having a shop do it. Local performance shop recommended I go to a specific place that should do it for $25. Ah I forgot to update. I went to a shop and they wanted $70 for one side. I said no. Toyota said they won't do it at all. Soooo I'm just gonna try again with the DIY. Either get some scraps of pipe and cut it to size or buy the $73 bearing press set and do it properly. Got the press set, pressed out the bearing successfully at my friend's place and pressed the new one in. Felt good! End of the day win after a few hours of nonstop losses. Inner race still stuck on the hub, tried to rent a claw puller but that didn't work. Kept popping off. Rented a bearing splitter but we couldn't get it situated on his press, couldn't get it off the bars high enough to make room for the hub to drop. So I took my W, went home and I'll just cut the race off like I planned to earlier. Also pressed the bushing out of the trailing arm, and noticed it was pretty bent. What isn't bent on my car?? So we straightened it with a vise and I'll likely need a new one sometime. For now it's getting poly bushings from SuperPro and going back together this weekend hopefully. Gotta return all the rented tools, bust out the Dremel and hacksaw, and get that all assembled. Cut the race off the hub, Dremel went through it very easily. Cut most of the way and tapped it off. Cleaned up the hub and proceeded to use that press kit to press it in. Stupidly used the wrong plate on the knuckle side and ended up pressing the inner race of the new bearing 1/2" out. Pressed it back together flush and it looks fine, seal lines up and all, and it spins exactly the way it did before. Really hoping I didn't damage anything. Now getting a small hand saw to saw out the bushing sleeve from the knuckle to install SuperPro bushings and get it all back together. Maybe this will happen today.